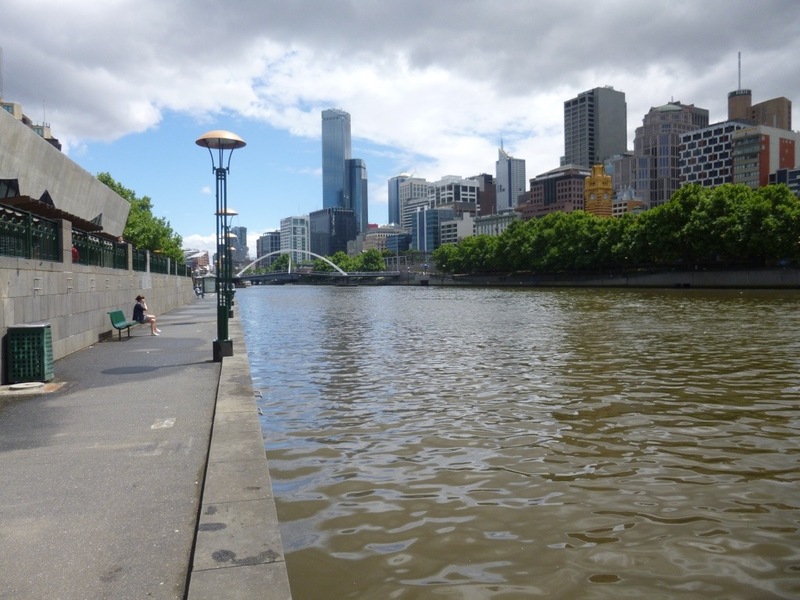 Melbourne is considered to be one of the most livable cities in the world and I can certainly see why. 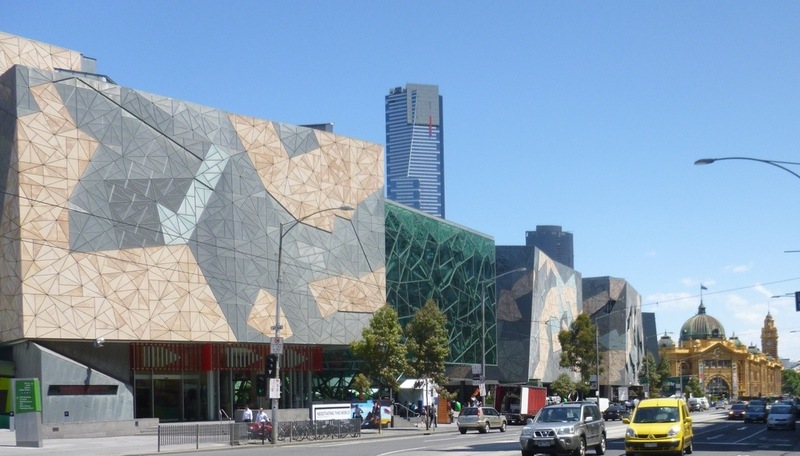 At a population of just over four million it has all the advantages of a large center – it’s the second largest city in Australia – but with no real geographic barriers, the city sprawls unimpeded along the beautiful Yarra River and is notably easy to get around in. 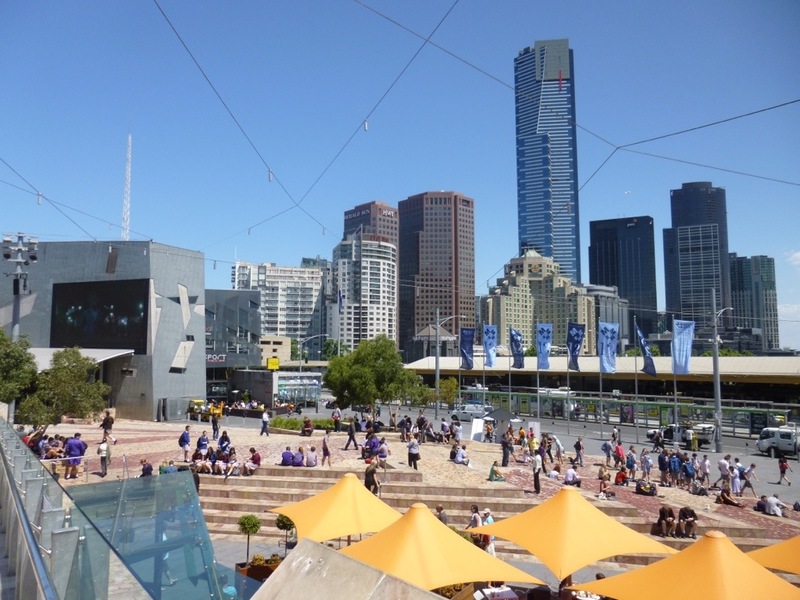 Federation Square is in the center of the city. 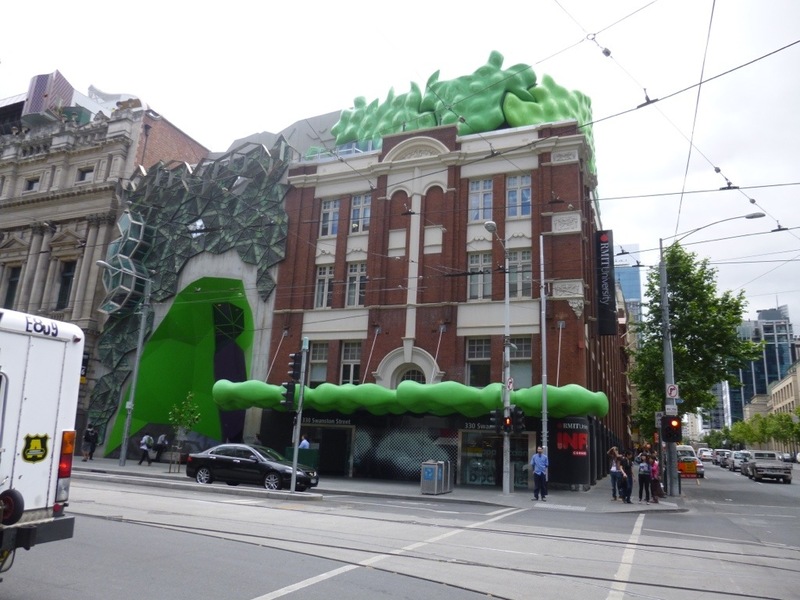 This is the Australian Center for the Moving Image. 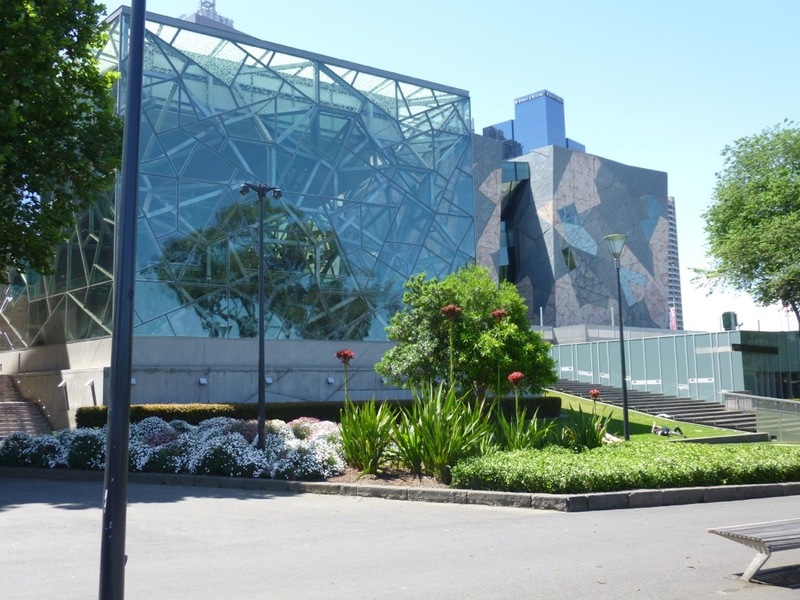 The ACMI and the National Gallery of Victoria incorporate this fabulous and inviting outdoor space. 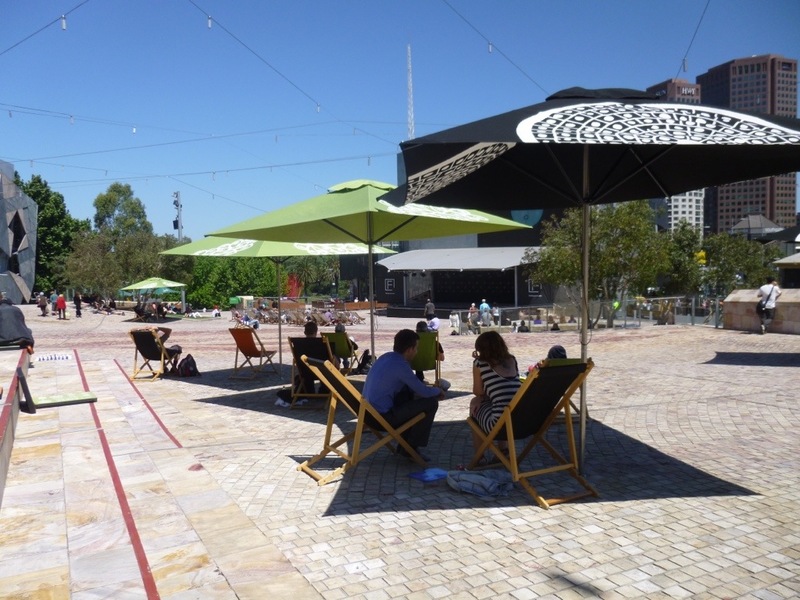 I guess it’s the great weather here that makes these wonderful plaza’s practical, as I have seen them everywhere I go and even mid-week the space is very well used. Appropriately, there is a movie playing on the huge screen and folks can pull up a lawn chair and lounge to their hearts content. Didn’t bring your lawn chair with you? No worries! Just help yourself. 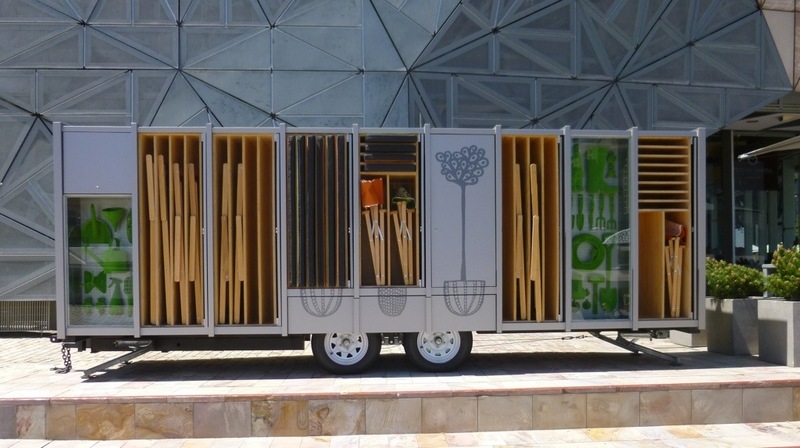 I’ve said it before and I’ll say it again – my gosh these Aussies are welcoming and clever. 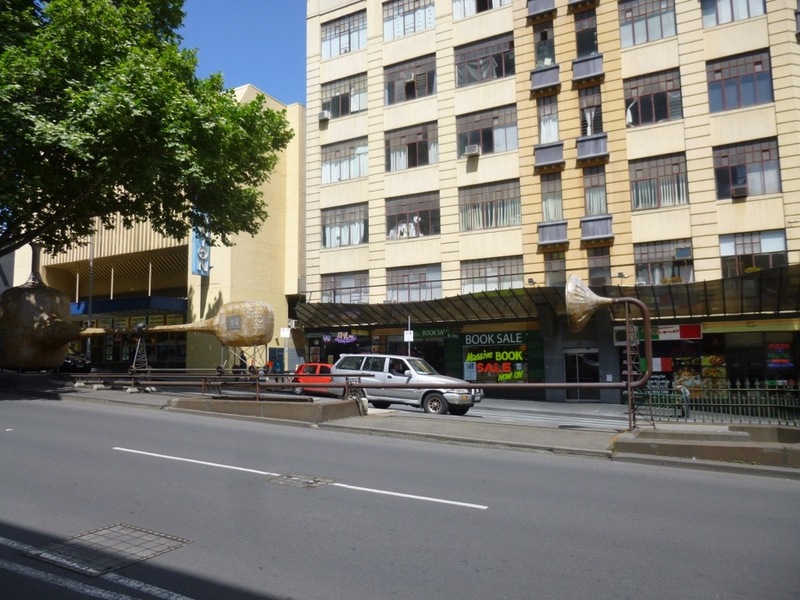 This city has seriously dedicated itself to the pursuit of the interesting, and just about every spare patch of streetscape has been used to make the point. 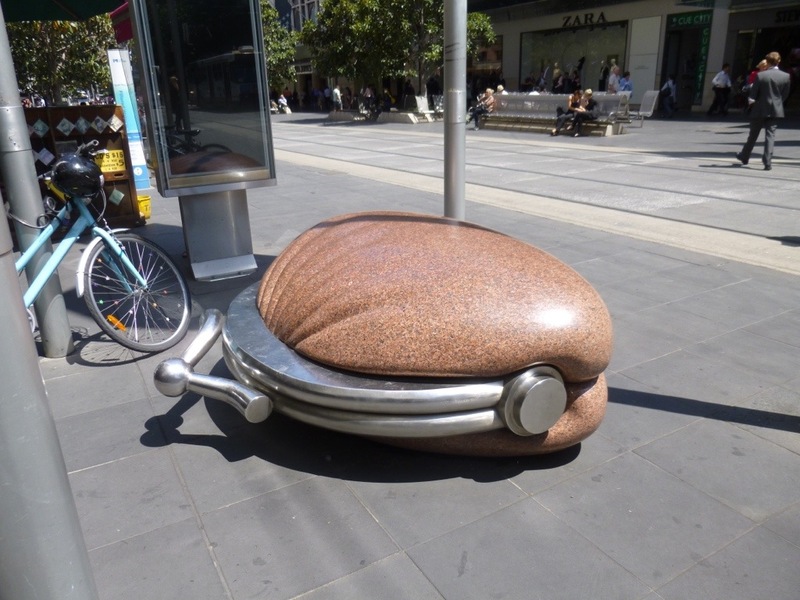 You have to look very closely to pick up on this one and I’m not actually sure what this is, but you have to admit – it is interesting. 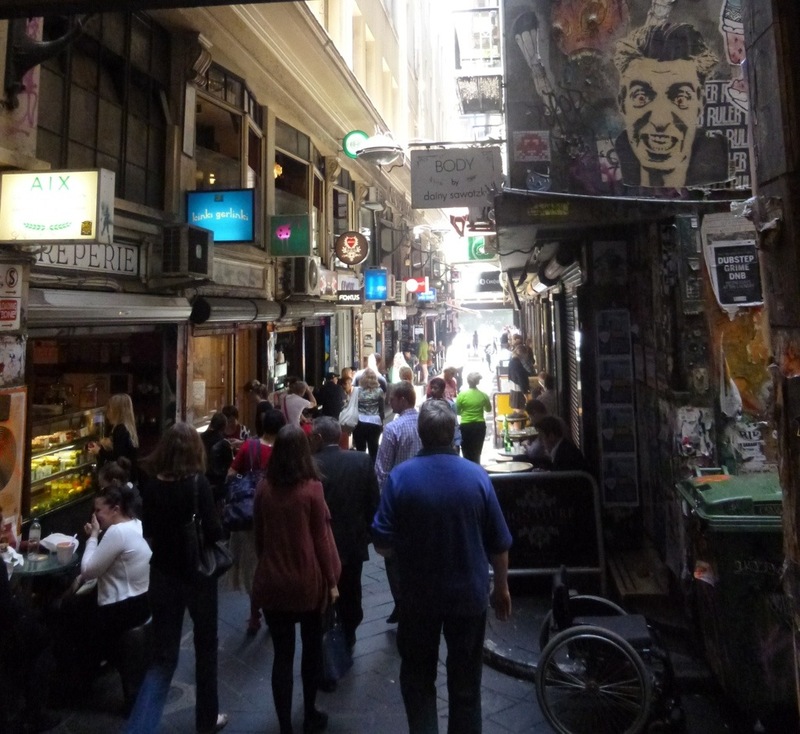 Melbourne is noted for it’s many beautiful arcades and fascinating lanes. 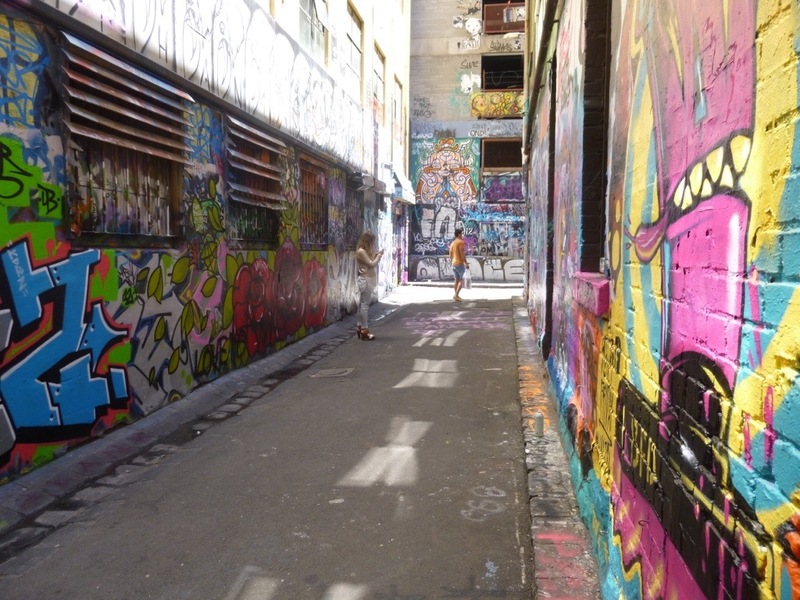 Originally used as service-ways for horses and carts, the lane ways have evolved into important – and high priced – commercial spaces that are a unique part of Melbourne’s charm. 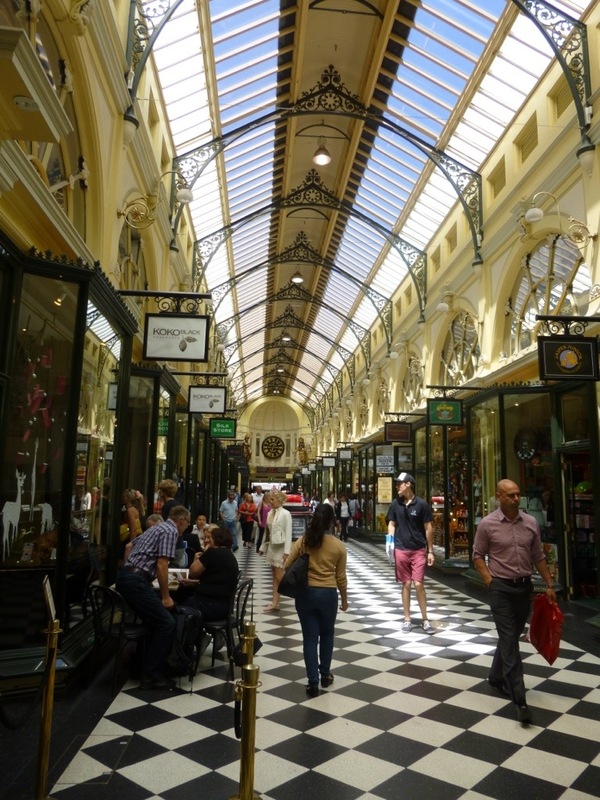 Royal Arcade is one of the oldest and best known. 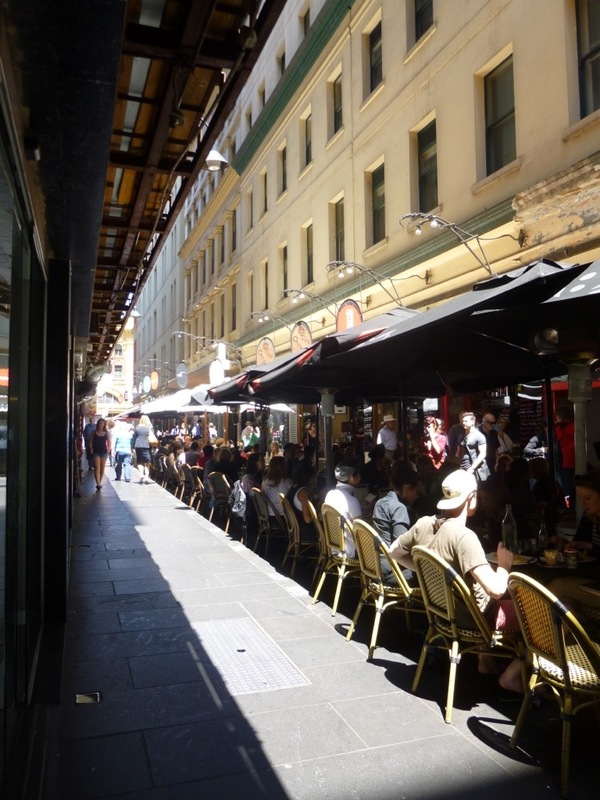 Block Place and Degraves Street have developed into several blocks of wonderful lane way shops and cafes whose ‘special of the day’ includes a large helping of people-watching. I had a leisurely lunch here doing just that. 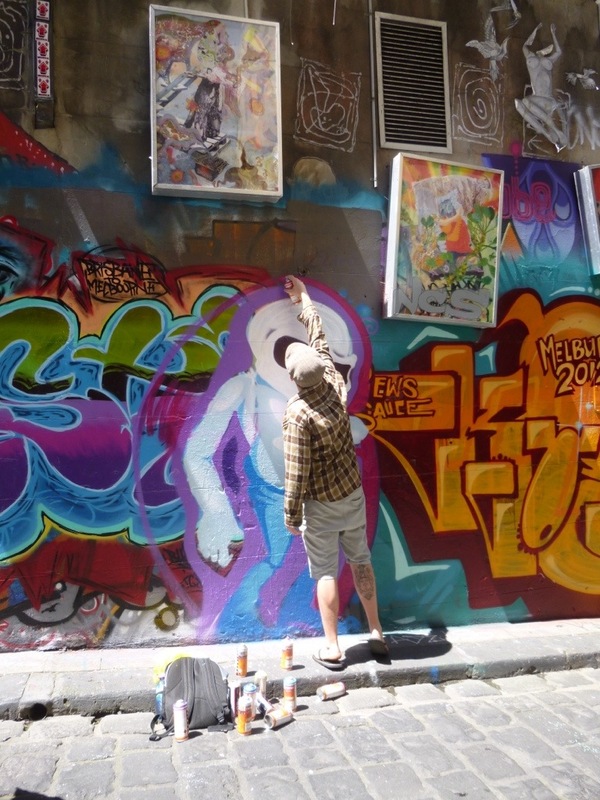 I have massive respect for any city that recognizes graffiti as an art form in such a fabulous way. 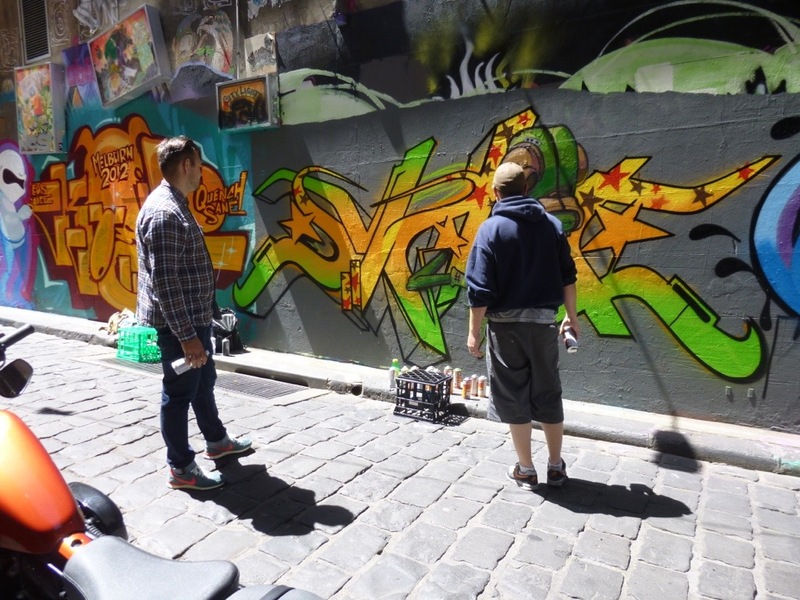 Hosier Lane is given over to graffiti artists and, true to the nature of the art it is in a state of perpetual flux as one masterpiece supersedes another. 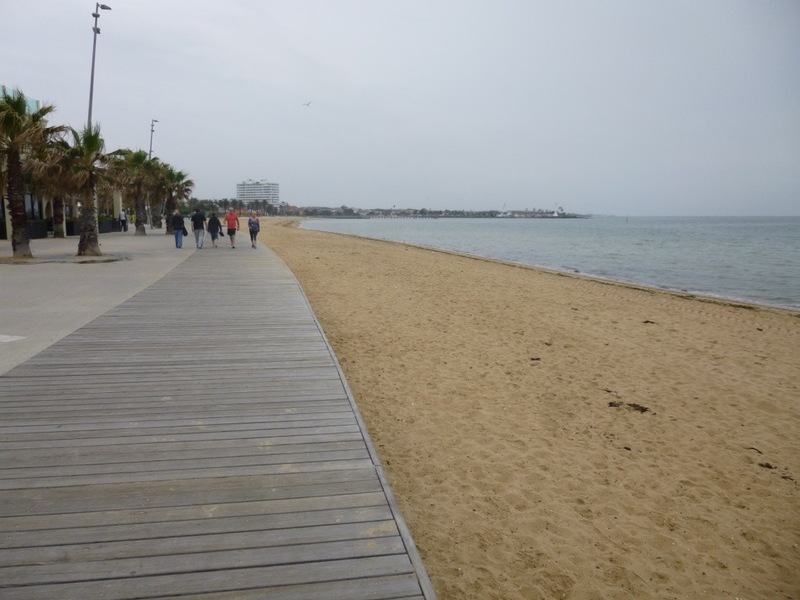 My Melbourne walkabout took me to St. Kilda Beach where I strolled the boardwalk enjoying some of the best views in Melbourne. It was a bit cool for swimming and the thought of Great White Sharks crossed my mind. But I did overcome my better judgement long enough to dip my toes into the Southern Ocean. 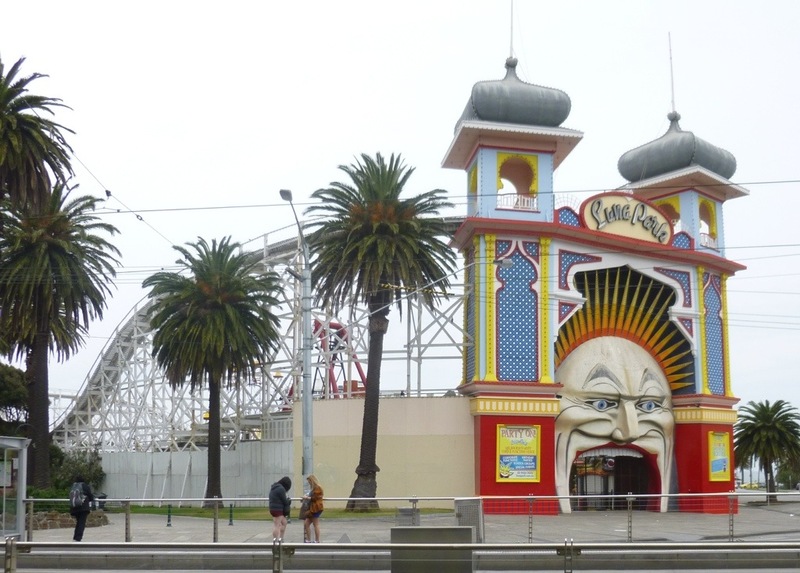 The historic Palais Theater and Luna Park – landmarks at St. Kilda’s and a throwback to a time when a day at the beach included having the wits scared out of you on the roller coaster. 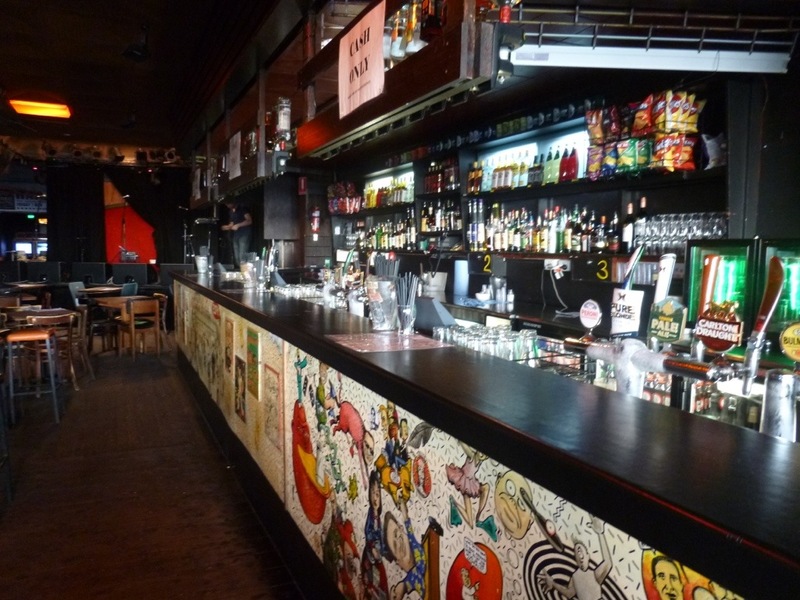 Apparently you haven’t been to St. Kilda unless you’ve had a beer at The Espy. I met an Aussie friend for dinner and we had our ‘pre-game’ cocktails here. This is a place where local talent gets a start and I was tickled to see a poster for the Pierce Brothers. 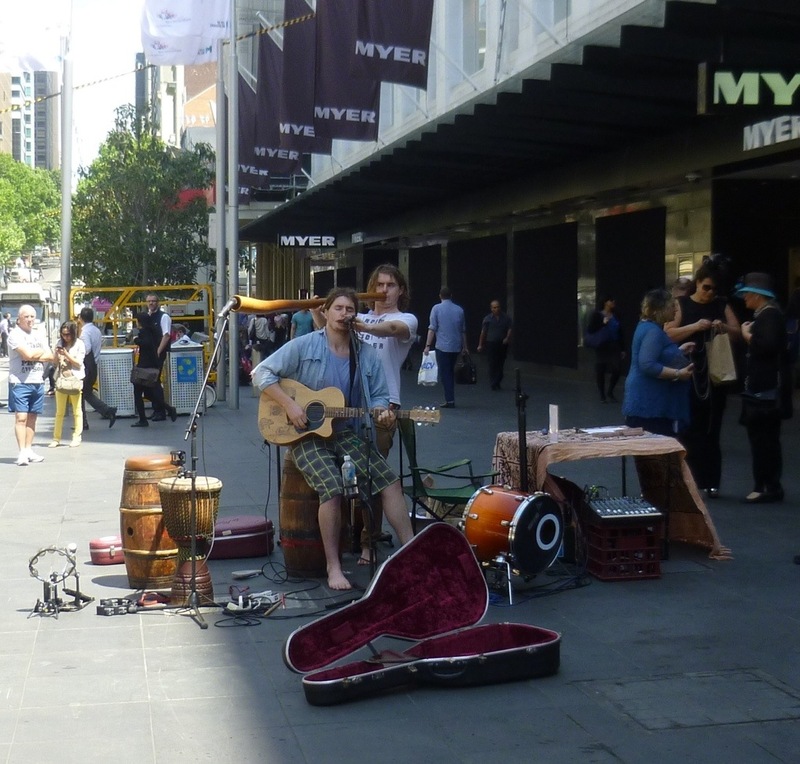 I had seen these twins busking on the Bourke Street Mall in Melbourne and they stopped me in my tracks – they were that good. Google them. Really! The Pierce Brothers. They were fantastic! Note the bare feet and if you look closely you’ll see that the twin in the back – Patrick, I think – is playing the didgeridoo and holding the harmonica for the other twin. I really hope that when they make the big time – which I feel they surely will – they still perform shoeless. Check them out on Facebook. Awesome. 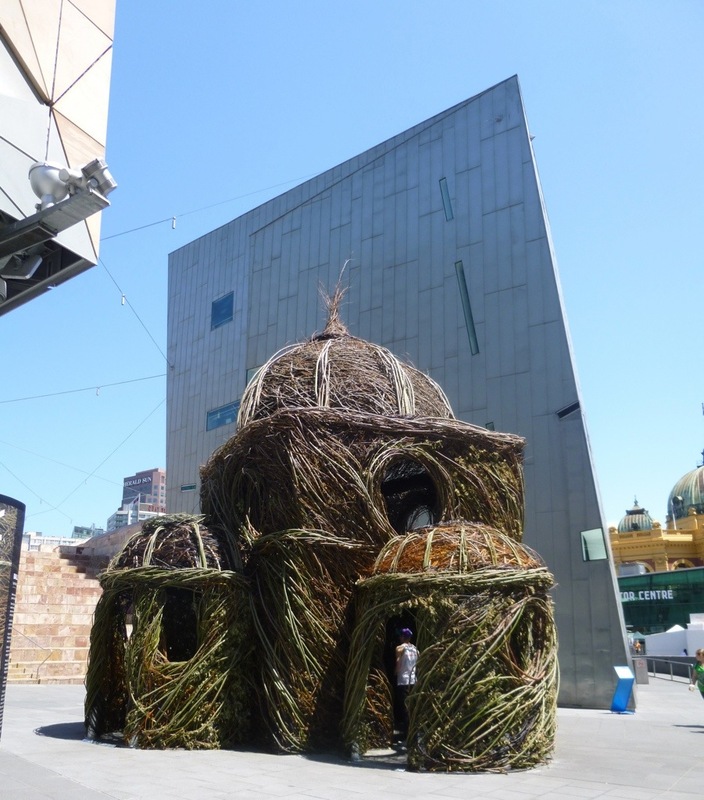 This twig house makes a pretty incredible juxtaposition to the Australia Center for the Moving Image. 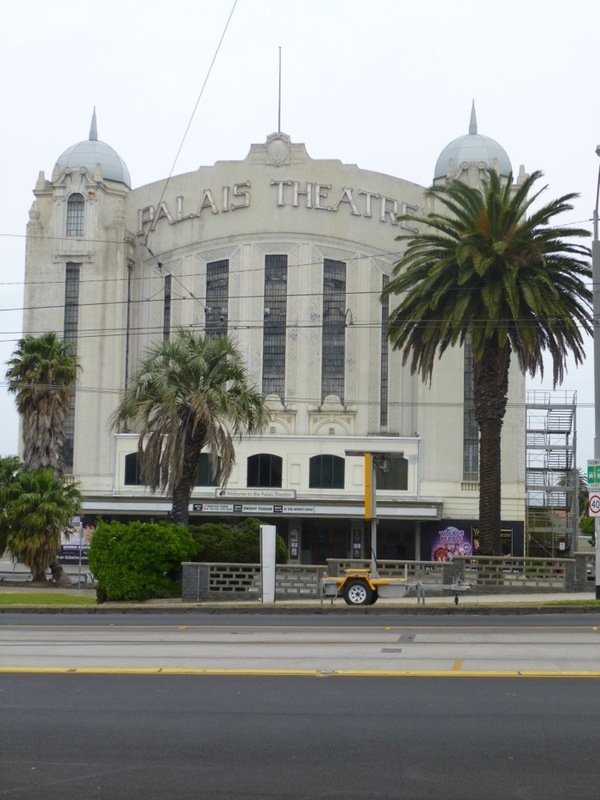 Melburnians have done a great job of preserving the best of the old. 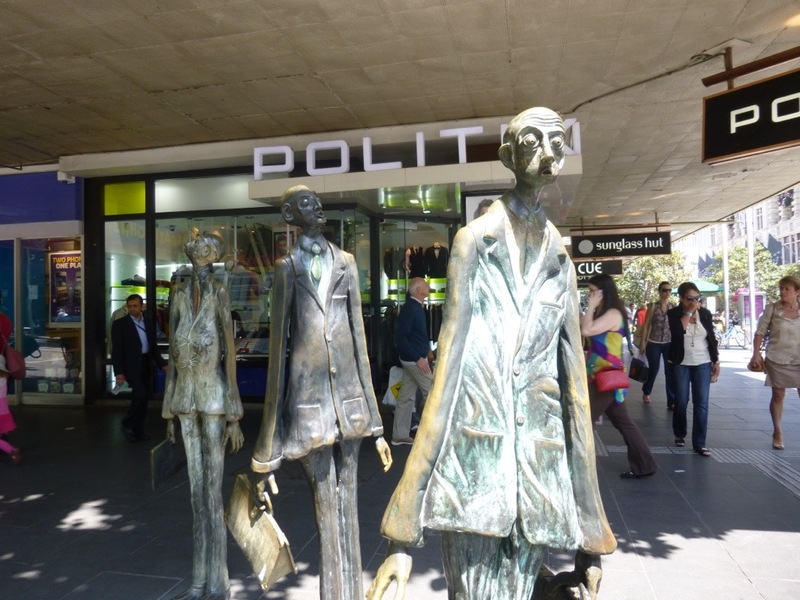 I laughed out loud at this…um…sculpture?…in front of the Libra-RY. 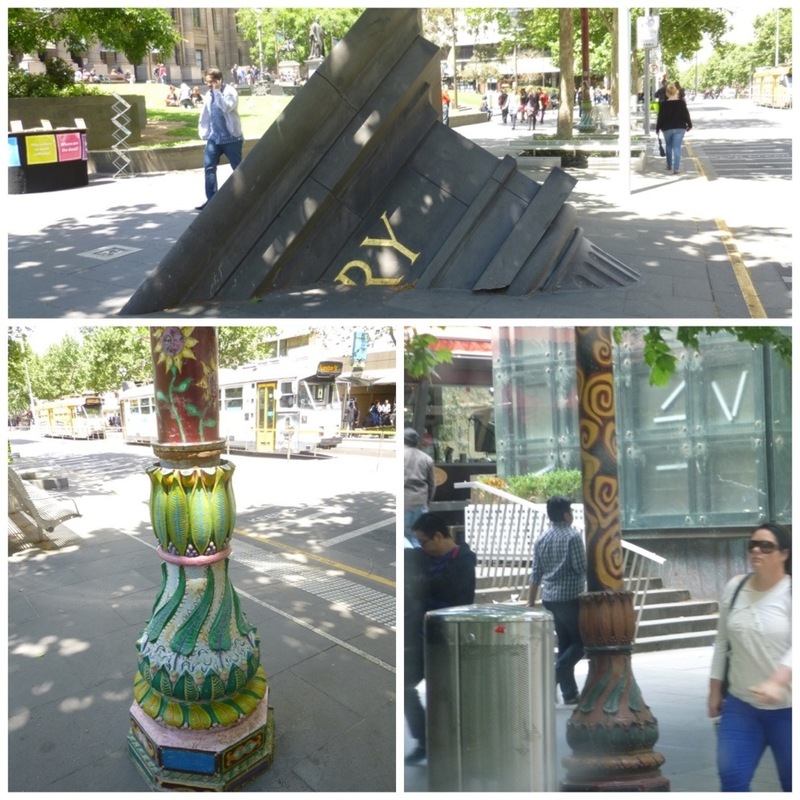 And even the light standards get into the art scene. 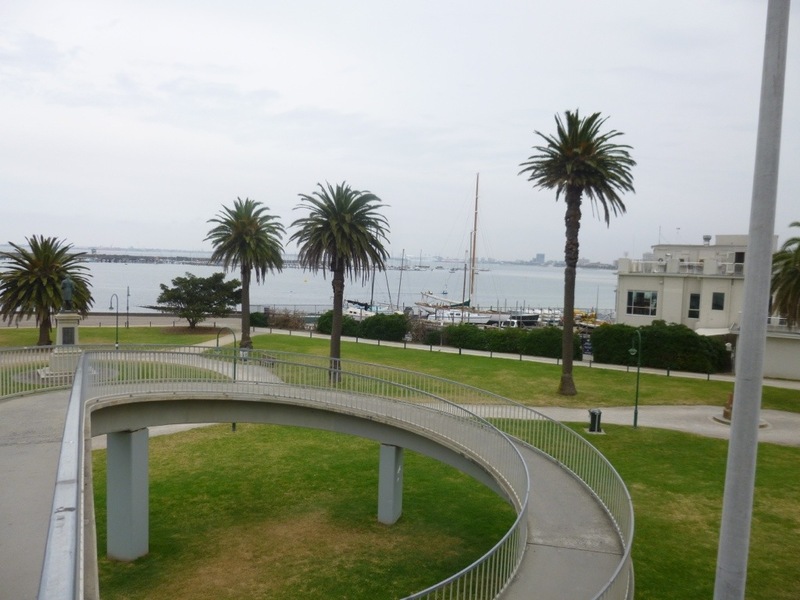 This is a fabulous place for getting around. 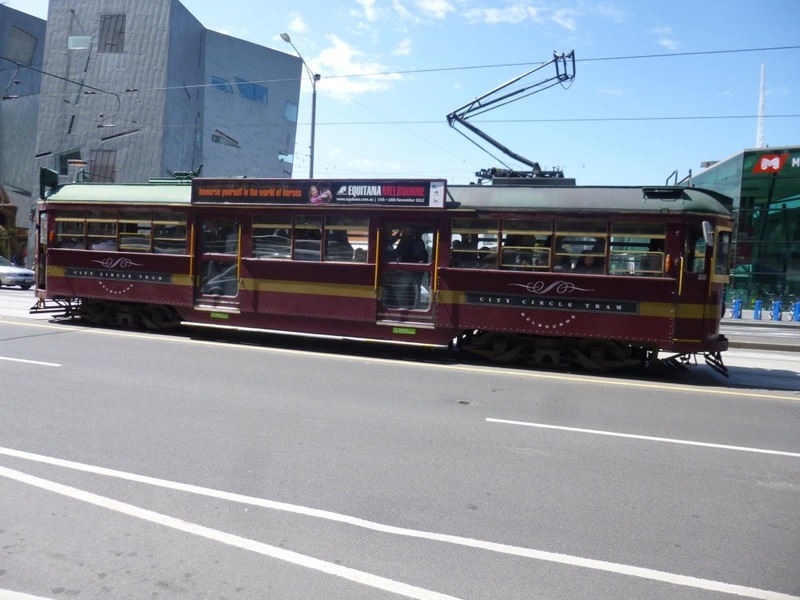 Almost everywhere is within walking distance of the electric train system and in the downtown area trams are a great way to see the sights. They even have a tram restaurant! You book your table for an hour and a half and see the city while enjoying fine dining. I did not do this but I wish I had. So much to see here that I had to make some tough choices. I have no trouble whatsoever asking for directions. Particularly after an hour of trying to find my way by the position of the sun in the sky. 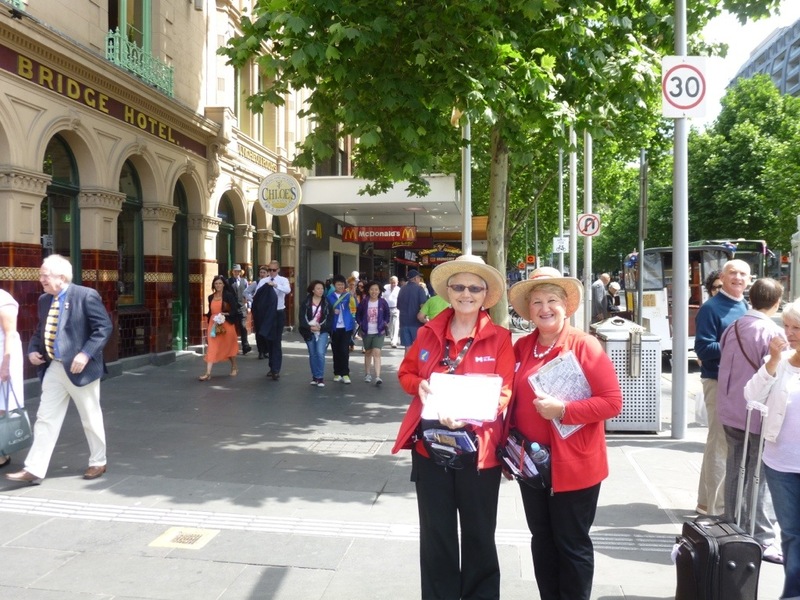 These city ambassadors are a wealth of information and lovely folks, too. Thanks for reading, Cath! I’m a little behind because I’ve been having such an amazing time. Also because wifi has been a bit challenging in some places. Boy, do I ever love Australia. Awesome place. 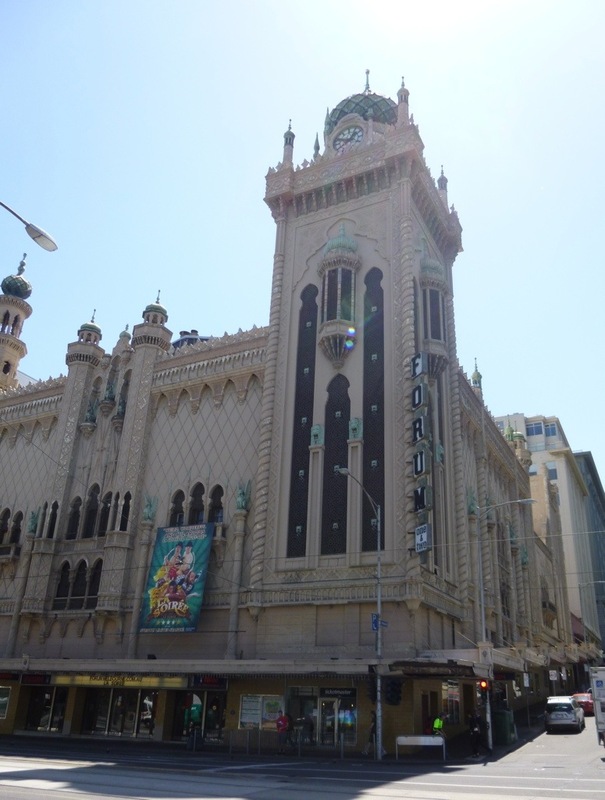 Hi Terri, I am a Melbourne girl and I have to say you have captured the town beautifully, your photos are amazing! So pleased you enjoyed your stay there!! stay safe and enjoy a little Shiraz! Wow, this is truly amazing! 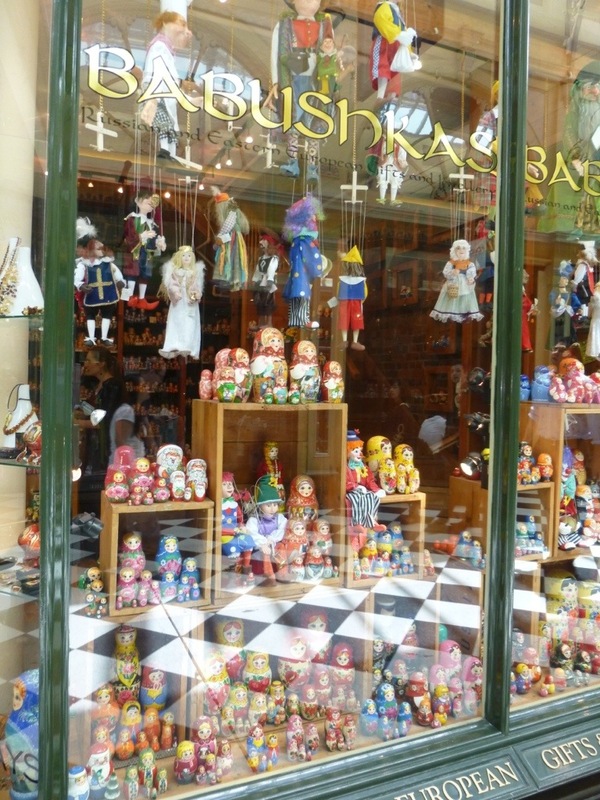 What a fabulous place.